Buy the $.99 downloadable map! During the winter Nordic skiing is the most popular activity in Young State Park. The trails are not groomed but due to its close proximity to Boyne City they are usually skier-set and more than adequate for classic skiing. With very little change in elevation, the skiing is easy and ideal for novice skiers with a fear of downhill runs. 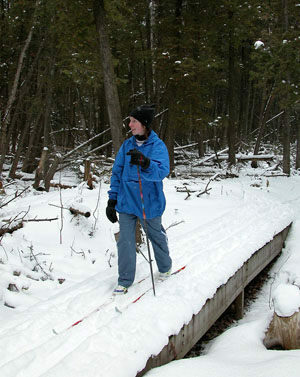 Overall the skiing at Young state Park is a woodsy experience with an opportunity to spot a whitetail deer or two. Trail post No. 0 across the road from the park headquarters serves as the winter trailhead and marks a Nordic system composed of Spruce Nature Trail, Deer Flats Nature Trail and segments of unplowed park road. Skiing is in a counter-clockwise direction along two loops that begin with the Spruce Nature Trail and then return along a stretch of Deer Flats. The official distances are 3.4-miles along the first loop and 4 miles along the second but that’s generous and the actual distances are probably less. The route described below is the 4-mile Loop. 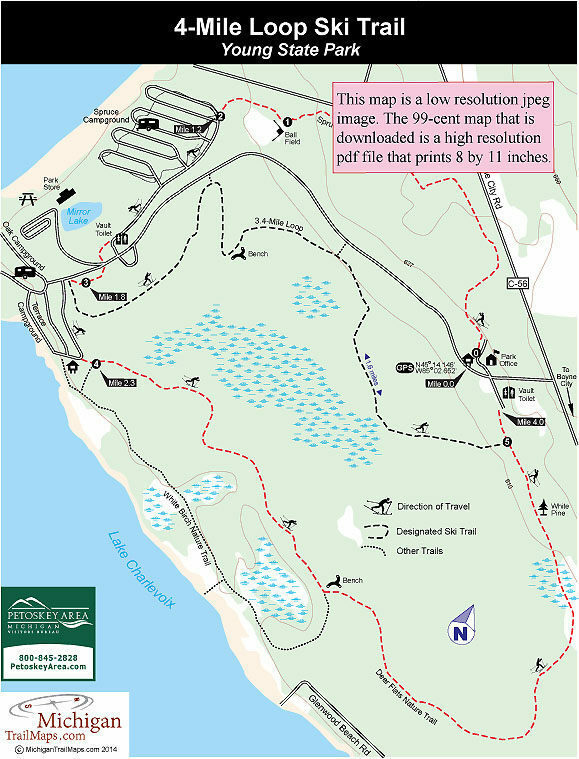 There are no heated restrooms, warming hut or ski rental concessionaire at Young State Park. For those types of amenities you need to head to Boyne Mountain Ski Resort outside Boyne Falls. Post No. 0 marks the start of the ski trail which begins in a snowy woods but quickly breaks out within sight of Boyce City Road and then a power line. Hang in there, it gets better. You stride back into the woods and after post No. 1 come to the only Caution Hill! sign in the park. The “hill” is an ever-so-gentle downhill run past the ball field to post No. 2, on the edge of Spruce Campground and reached at Mile 1.2. The campground is closed so you can follow the park road pass a vault toilet and back into the woods briefly. At post No. 3 you can return to the trailhead along the shorter 3.4-mile loop (left-hand fork) or continue on the 4-mile Loop by following the unplowed park road to the Timbledoodle Mini-Cabin in Terrace Campground. The longer route is just as easy but more interesting. From the mini-cabin you re-enter the woods and ski the 1.7-mile segment from post No. 4 to post No. 5. Most of it is in the woods and much of that are stands of northern white cedar with the trees leaning every which way. Within a mile you break out in an open cattail marsh and then arrive at post No. 5. Follow the right-hand fork and within 100 yards you will arrive at a parking area with a vault toilet. The Young State Park campground is closed in the winter and other facilities are limited. The park is open year round, offering Nordic skiing and snowshoeing in the winter. A vehicle permit or annual state park pass is required to enter. From Boyne City head northwest on Boyne City Road (County Road 56) 1.5 miles to the park entrance. For more information on the park contact Young State Park (231-582-7523) while campsites can be reserved online (www.midnrreservations.com) or by phone (800-447-2757). For lodging or other travel information contact the Petoskey Area Visitors Bureau (231-348-2755, 800-845-2828; www.petoskeyarea.com). by travel and outdoor writer Jim DuFresne!